Dec 6 (AZINS) A video of a rally addressed by Congress leader Navjot Singh Sidhu in Alwar during the campaign for Rajasthan Assembly elections showed some people raising pro-Pakistan slogans. Zee News played the video prominently and questioned Congress' and Sidhu's stance on the "Pakistan Zindabad" slogans raised during the rally. However, Congress leaders were defiant and accused Zee News of playing a doctored video. Sidhu even threatened to file a defamation case against Zee News. Congress supporters launched a campaign against Zee News on social media which was also supported by a few media houses and journalists. Congress leaders went as far as possible to tweet suitably edited videos that omitted the part where the slogans were raised. The Zee News team got in touch with the common people and journalists present during Sidhu's Alwar rally and got hold of seven different videos of the same rally which were recorded by journalists. 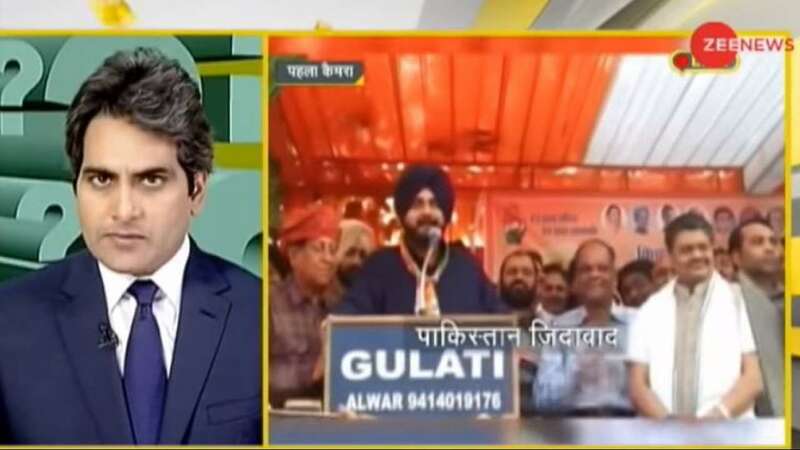 One local journalist came on camera to expose the Congress party and pointed out the "Pakistan Zindabad" slogans were indeed raised while Sidhu was addressing the rally. Zee News editor-in-chief Sudhir Chaudhary also took on Congress leader Randeep Surjewala for his tweet, where he alleged that Zee News played a fake video of the rally and the slogans raised were "Sat Sri Akal". Surjewala had tweeted a video of the rally to buttress his claim. But Sudhir Chaudhary demolished Surjewala's allegations too and established that the video posted by the Congress leader was suitably edited and showed the proceedings after the "Pakistan Zindabad" slogans were raised. This is not the first time that Zee News has been cornered. A similar smear campaign was launched when anti-India slogans were raised at the Jawaharlal Nehru University (JNU) in 2016. Several questions were raised after Zee News ran videos showing anti-India campaign being raised in JNU. However, the videos were found to be genuine in forensic tests.